bl.uk > Online Gallery Home	> Online exhibitions	> Asia, Pacific and Africa Collections	> Kalyani Sima, [Pegu]. 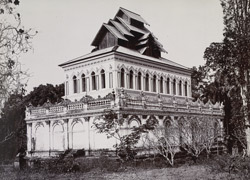 Photograph of the Maha Kalyani Sima hall in Pegu (Bago), Burma (Myanmar), from the Archaeological Survey of India Collections: Burma Circle, 1907-13. The photograph was taken by an unknown photographer of the Burma Archaeological Survey. Bago, the fourth largest city in Burma, is about 80 kms north-east of Rangoon and was once ancient Hanthawadi, the capital of a Mon kingdom. It is said to have been founded in the 6th century by two Mon princes from Thaton, but achieved its greatest prosperity in the later Mon dynastic period of 1369-1539. To Europeans, it was the important seaport of Pegu. Today little remains of its regal past. The Maha Kalyani Sima (or Maha Kalyani Thein) is a Sacred Hall Of Ordination built by King Dhammazedi in 1476. He built hundreds of such simas or halls for the ordination of monks all over the country, modelling them after Sri Lankan plans. It was burnt in 1599 by a Portuguese plunderer, rebuilt, then destroyed again during the sacking of Pegu in 1757 by King Alaungpaya who wished to vanquish the resurgent Mon. The building's turbulent history therafter encompassed fires and earthquakes, and finally it was levelled in the earthquake of 1930. The present building dates from 1954.